But then I usually mention 'however, I think one can improve their game just by learning and understanding some of the basics of TGM.' This usually draws some criticism, but I honestly do not believe that understanding the basics will hurt a golfer's game. Applying the basics of TGM incorrectly can certainly hurt a golfer's game. It's sort of like a person who has driven automatic shift in their cars all of their life now learning how to drive stick shift. If they learn stick shift, that won't make them a worse driver of automatic shift. However, if they try and apply some of the actions of driving stick shift when they are driving automatic, then they will run into some problems. From there, I usually get asked 'what are the basics of TGM I should know' and then I give them some answers, but tell them to look it up over at Jeff Mann's site (http://perfectgolfswingreview.net/) or Lynn Blake's site at (http://www.lynnblakegolf.com/). And of course, they are a bit too lazy to do it and keep coming back to ask more questions. So to help out with that, I will be have a series of posts going over what I think the basics of TGM that can help an average golfer are. I also plan on posting a few homemade videos to better help illustrate my point. Part I will be a very basic overview of TGM. PLEASE NOTE: I am not an expert on TGM. I'm not even certified in TGM instruction. If you have disagreements, feel free to share your thoughts. If I made an error LET ME KNOW! One of the main purposes of this blog is to help golfers get better. And the best way to do that is with accurate information. The Golfing Machine was written by Homer Kelley in 1941 and published in 1969. By his second time golfing 18 holes, Mr. Kelley was able to apply some of his general knowledge of physics and geometry and shoot a score of 77, an amazing feat for most golfers. However, when he wanted to learn more about why he was able to play so well so quickly, the answers he got from local club pros were insufficient for his tastes. Mr. Kelley later went on to work for Boeing as an engineering aid. He wasn't technically an engineer, but he was a valued employee because he had the unique skill of solving problems for the company. For instance, a product may be malfunctioning and they could not figure how to make correct the problem and Mr. Kelley would be given the project and could come up with a solution to the problem. I believe Mr. Kelley looked at the golf swing in a similar fashion to the way he looked at problems he worked on while at Boeing. He looked at the problem as 'how does one figure out how to hit the ball properly time and time again.' And the solution Mr. Kelley came up with was that there were almost countless answers to this problem. Meaning, that there were almost countless ways to effectively swing a golf club so a golfer can hit the ball with power, accuracy and consistency. He then came up with the book 'The Golfing Machine' going over all of those solutions. To expand a bit further, Mr. Kelley looked at the golf swing like a machine, much like a car. He stated that each 'machine' had 24 parts to it. And out of those parts, there's 3-15 variations of each part. And there were only 3 imperatives that each of these machines MUST have to efficiently hit the ball. And each machine, much like the cars of today, has a 'computer.' Except this machine's 'computer' is the golfer's brain. The golfer's 'computer' is crucial and needs the proper feedback to help make the machine more effective and efficient. To start, I'll go over the 3 imperatives of the golf swing according to Mr. Kelley. What is so BRILLIANT about The Golfing Machine is that if you don't know any better, you would think that there are SEVERAL IMPERATIVES according to popular golf instruction. Popular golf instructors, even guys in Golf Digest's Top 10 instructors, will tell the golfer that there's no one way to swing the golf club. Then they will instruct the golfer on a bunch of imperatives and if the golfer can properly execute those pieces of instruction, they'll wind up develop the same 'one way' golf swing as the next student the instructor has. So, if you truly believe that there is no one way to swing a golf club, then that means there can only be very few imperatives to the golf swing. Otherwise, everybody would start to have swings that look exactly alike. This is the #1 imperative to the 'machine.' With it, a golfer can come closer to maximizing their power, accuracy and consistency. Without it, a golfer will never be as powerful, as accurate and as consistent as they would be with a flat left wrist at impact. Watch anybody on the PGA Tour over the past 20 years and they all have a flat lead wrist at impact. As the picture above shows, Tiger has a flat left wrist. The key to check for is how the left arm lines up with the clubshaft. Here's a pic of the same golfer. One with his left wrist bent on the left and the left wrist flat on the right. As you can see, the pic on the left *looks* like he has a flat left wrist, but he actually does not. If his left wrist was flat, the shaft would be right in line with the left arm. When you look at the pic on the right, he does have that straight line relationship with the clubshaft and his left arm, thus a flat left wrist. This imperative goes a bit hand in hand with the #1 Imperative, a FLW (flat left wrist) at impact. You'll hear a lot about 'stressing' the shaft in your swing, that's what a clubhead lag pressure point. A big key about TGM to remember is that if the left wrist is flat at any time in the swing, the right wrist must be bent. So for *some* golfers in order to obtain a flat left wrist at impact, they actually focuse more about keeping the right wrist bent at impact because you cannot have two bent wrists when gripping the golf club. Now, if I were to hold the club in my hands with a flat left wrist and a bent right wrist there would be know 'clubhead lag pressure point' because the golf club has not moved. Lagging is anytime something is trailing behind. In our 'machines', you want the clubhead to be lagging behind the hands. If you swing a club and are able to have a flat left wrist and a bent right wrist at impact, you will now have some sort of clubhead lag pressure point in your right hand. Every swing has lag to it, the key is to SUSTAIN the lag thru impact. The bad golfers will lose their lag before, if not well before, impact. I think this imperative is a bit too overanalyzed at times. Essentially, if you can understand what a flat left wrist looks like at impact and then be able to execute a flat left wrist at impact, you'll have this imperative for you. I think most golfers understand what 'swing plane' is to some degree. They also understand that some golfers have a more upright swing plane (i.e. Nicklaus) while some have a flatter swing plane (i.e. Hogan). This video of the SmartStick training aid device by Martin Hall shows what a 'straight plane line' looks like. Now, if the laser were to not point down on the blue plane line that Hall has in his video, that would be known as a 'bent plane' line. This is another beauty of TGM. Again, it's not saying you are better off with a 'one plane swing' or a 'two plane swing', it's just saying that you have to keep the laser on the blue plane line or you will get in trouble. One plane, two plane, upright or flat swing planes can all keep the laser on the plane line with relative ease. 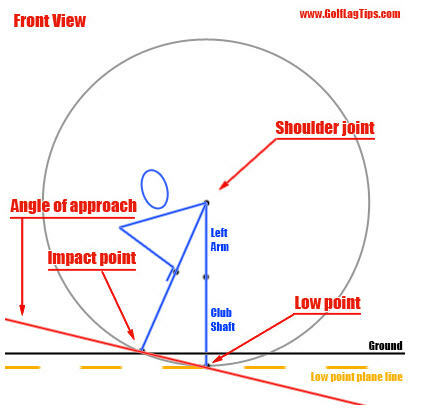 The last part for today's 'lesson' is a brief understanding of the 'geometry of the circle' in the golf swing. Now, we don't need to get into in-depth analysis of the the geometric relationships in the swing, but just a very basic understanding. From the face on view, the golf club moves in a circular motion. The lowest point the club will travel will be opposite of the left shoulder as shown in the diagram above. Inevitably, golfers have the golf ball usually towards the middle of the feet which is in back of the low point. With this geometry, this makes the golfer hit the ball FIRST and THEN take a divot. Because as they hit the ball they still have yet to reach the low point with their clubhead. So what happens is they hit the ball FIRST and then the clubhead goes DOWN even LOWER and takes the divot. This KJ Choi video will show it in action (take a look at the :52 mark). The big reason why the flat left wrist is so important is that when the left wrist is bent (aka 'flipping thru impact'), this disrupts the geometry of the circle. The low point moves from the left shoulder joint to say inside the left heel and depending on how much the left wrist bends, that will change the low point. What's funny about all of this is you will often hear high handicappers say they have been 'looking up' and that's why they cannot hit the ball. But often times it's not a case of looking up and taking their eye of the ball. It's more of a case of such a bent left wrist at impact that they have destroyed the geometry of the circle and will hit that extremely poor shot. Smartly enough, Mr. Kelley did not make 'keeping your head down' an imperative of the golf swing. 1. Almost countless different swings that can hit the ball with power, accuracy and consistency. 2. Because there's so many different swings, there's only 3 imperatives. 4. Geometry of the Circle. From the Face On view the clubhead moves in a circle. Lowest point of travel for the clubhead is the left shoulder joint. This will cause the golfer to hit the ball first, then take a divot. Up next, 3 dimensional impact. LagPressure's "Holding The Shaft Flex"